Try using our versatile square metal CD tins for a variety of projects. Our slip cover CD tins can be purchased with or without CD and gift card inserts. Each hinged tin includes a blue plastic insert to hold your CD securely. 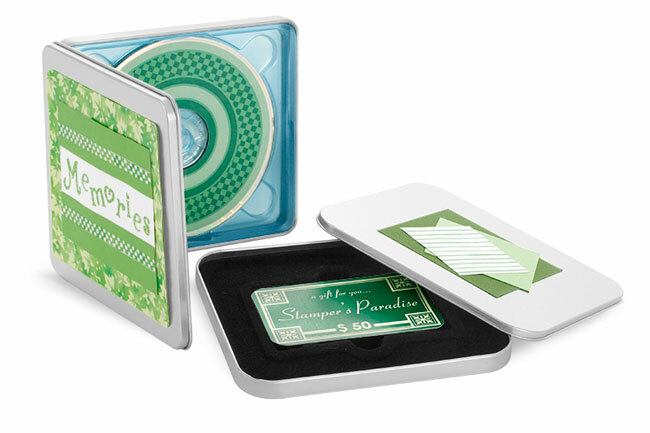 The hinged and slip cover CD tins could be ideal for gift cards, digital scrapbooking projects, DVDs and more! Decorate the brushed metal cover and add a CD label to your creation for an elegant keepsake!